The “icing on the cake” – not just one Boss but two. Unbelievable: Recaros, Torsen LSD, and even more focus on track events. The following is exactly the type of press release we were hoping for – lots of technical details. But many are still missing – for example, who makes the shocks? It doesn’t appear that series sponsor Koni makes them, there is no shot in the press pictures of the upper strut tower adjustment point, and the struts themselves are not Koni red. One thing is not clear – the valve in the exhaust that you’d purchase to enable the side exhausts. Where does that come from, is there a kit? 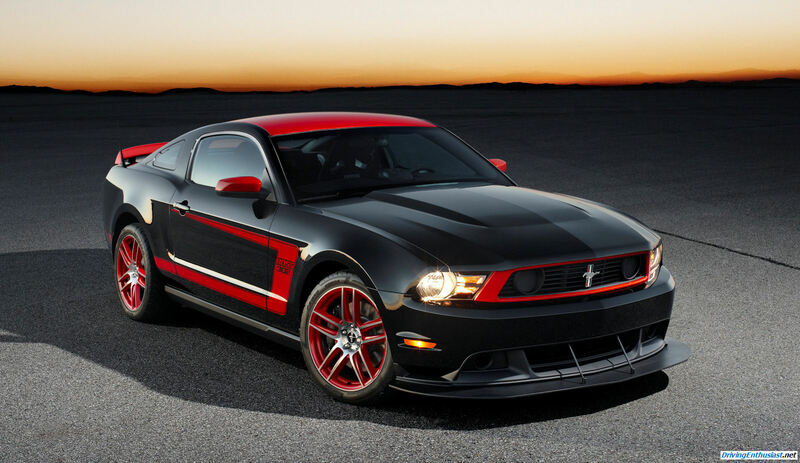 And another little slip – that the Recaros will be offered in the 2012 Shelby Mustang as well. Not that a Shelby is of interest to a driving enthusiast, but it does show how Ford is spreading the expenses around and that makes more development money available for the products that count. Now comes the tough part. The magazine road tests (and hopefully track tests) will start in a few months, and at some unannounced time the order books will open. And, Ford has yet to tell us the price of the Boss. It won’t be cheap.